[S16] Sandy Denbow Jameyson, "Sandy Correspondence," e-mail to Carl J. Denbow, 1993-present. [S119] Atlanta Constitution, 21 Nov 2009. Mary Etta Gray married J. W. Denbow, son of John Denbow and Jane Miller, on 7 April 1895. Her married name was Denbow. Roy Gray was born in 1880 at Ohio, USA. He married Emma Denbow, daughter of Hamilton Denbow and Ellen Thompson, in 1920 at Monroe, Ohio, USA. Hannah Green was also known as Hannah Lytle. Amy Grimes married Allen L. Devor, son of Robert Devor and Elizabeth McGinnes, on 22 March 1864 at Darke, Ohio, USA. Her married name was Devor. Asa K. Grindle was born in 1870. He married Mary Elizabeth Clark in 1880. Pauline Irene Grindle was born on 4 May 1894 at Ashland, Ashland, Ohio, USA. She, the father of Pauline Irene Grindle, presented her for baptism on 4 May 1894 at Ashland, Ashland, Ohio, USA. She married Clem Simon Denbow, son of James Tanner Denbow and Sarah Catherine Rose, in 1904 at Ashland, Ashland, Ohio, USA. Her married name was Denbow. Pauline Irene Grindle died on 13 May 1985 at Ashland, Ashland, Ohio, USA, at age 91. She was buried on 15 May 1985 at Ashland, Ashland, Ohio, USA. Richard Eugene Grosscup was born on 8 December 1930 at Zanesville, Muskingum, Ohio, USA. He died in October 1960 at Zanesville, Muskingum, Ohio, USA, at age 29. Catharine Gruver was also known as Gruser. She was born in 1791. Susan Sharp Notes: Tombstone in Alcola Cemetery near Hawthorne, Pa. states Catharine, wife of John Gruser died August 25, 1872 aged 81 years, ______ months, 11 days. She died on 25 August 1872. She was buried at Pennsylvania, USA. Susan Sharp's notes: Tombstone in Alcola Cemetery near Hawthorne, PA. Death Certificate of Christena Holben, wife of Samuel Holben, indicated that her maiden name was Gruver. I don't know if this John & Catherine are her parents, but we found their graves while visiting the Alcolah Cemetery where Christina and Sam are buried. John Gruver was also known as Gruser. Anna Maria Gurtner was also known as Gortner. She married Clement Junior Dunkelberger, son of Clement Dunkelberger and Anna Maria Hauer, in 1789. Her married name was Dunkelberger. Almeda E. Guthrie was born on 4 March 1910. She married Clifford Leroy Swan, son of Nellie Reid and Horace Crebs Swan, on 30 May 1926. Her married name was Swan. Almeda E. Guthrie lived at Reynoldsville, Jefferson, Pennsylvania, USA.1 She died on 30 November 1987 at Jefferson, Pennsylvania, USA, at age 77. Anna Elizabeth Gygax was baptized on 9 July 1826 at Near Bleienbach, Launek, Bern, Switzerland; Old documents sometimes refer to the country as the "Republic of Bern. "1 She was born on 9 July 1826 at Near Bleienbach, Launek, Bern, Switzerland; Old document refers to locationat as "Near Bleienbach, Launek, Republic of Bern. "1 She married François Maria Sitone on 31 May 1852. Her married name was Sitone. Collection: United States Census, 1870. [S34] Letter, Jlona Gygax-Sidler to Carl J. Denbow, 2 oct 1955. Christian Haldeman was born in 1793 at Pennsylvania, USA. He married Susannah Spohn in 1813 at Pennsylvania, USA. Christian Haldeman died in 1863 at Pennsylvania, USA. Christian Haldeman was born in 1743. He died in 1785. Resident Near Fultonham Dies Thursday of Heart Ailment. Mrs. Gigax died suddenly of a heart ailment Thursday morning at her home. She was a daughter of the late Dr. and Mrs. John Holdeman [sic] of Zanesville. She had made her home in Fultonham for many years. Besides her husband she is survived by five children, Mrs B. F.Wetzel, Dayton; Mrs. Edward Bendow [sic], Ashland; John Gigax, Pittsburgh; Edward Gigax, Marion, Ind; Miss Helen Gigax of the home; also 10 grandchildren and one great-grandchild. The body will be taken to the residence Friday noon from the William Thompson and Son funeral home. The funeral of Mrs Esther A. Gigax, will be held at 2 o'clock Saturday afternoon at her home, one mile west of Fultonham. Rev. Mr. Hardin of Fultonham M. E. church, of which she was a member, will officiate and burial will take place in the Fultonham cemetery.3 She was buried on 9 May 1936 at Fultonham, Muskingum, Ohio, USA. The funeral of Mrs. Esther A. Gigax, 80 years old, wife of Frank Gigax, will be held at 2 O'clock Saturday afternoon at her home, one mile west of Fultonham. Rev. 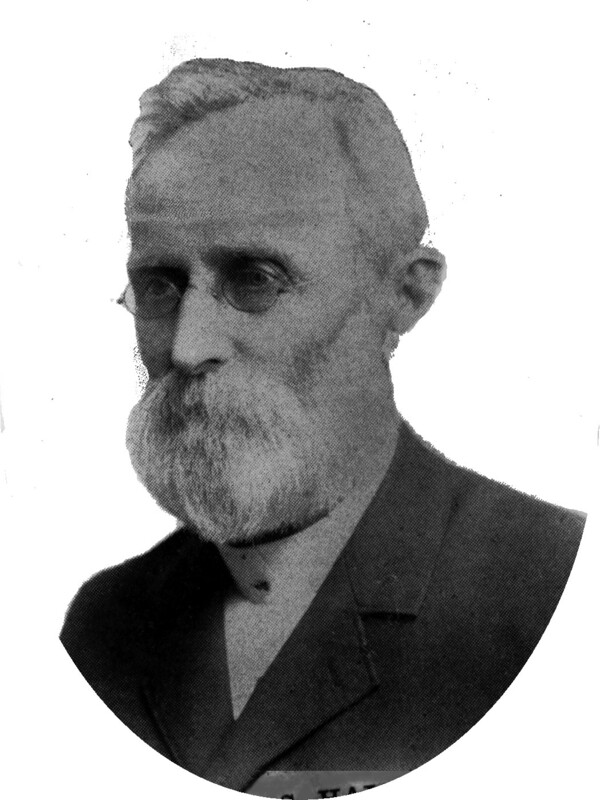 Mr. Hardin of the Fultonham M.E. church, of which she was a member, will officiate and burial will take place in the Fultonham Cemetery. Mrs. Gigax died suddenly of a heart ailment Thrusday morning at her home. She was a daughter of the late Dr. and Mrs. John Haldeman of Zanesville. She had made her home in Fultonham for many years. Besides her husband she is survived by five children, Mrs. B. F. Weitzel, Datyon; Mrs. Edward Benbow [sic], Ashland; John Gigax, Pittsburgh; Edward Gigax, Marion, Ind. ; Miss Helen Gigax of the home; also by 10 grandchildren and one great-grandchld. The body will be taken to the residency Friday noon from the William Thompson and Son funeral home. Jacob Haldeman was born between October 1721 and 1722 at Neuchatel, Republic Of Bern. He married Maria Miller circa 1742. Jean-Lois Haldeman was born in 1700 at Philadelphia, Pennsylvania, USA. John Haldeman was born in 1770. John Spohn Haldeman M.D. was born on 24 June 1819 at Lancaster, Pennsylvania, USA. He married Abigail Stevens Williams, daughter of Samuel Williams and Mary Stevens, in 1832. John Spohn Haldeman M.D. died on 18 March 1899 at Zanesville, Muskingum, Ohio, USA, at age 79. [S58] Charles Cerney, Muskingum Co. Medical History. Gaspard Haldiman was born circa 1680; ,,Yverdon. He was also known as Titl Honnete Haldiman.